It's always with fear and trepidation that I crack open a musician's memoir. For every Keith Richards autobiography, there are several dozen tomes that collapse under the weight of their own self-import and overwrought prose. 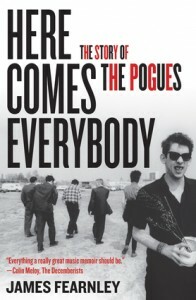 James Fearnley's new book, Here Comes Everybody: The Story of the Pogues is as enrapturing as any I've read. It starts off shakily, discussing as it does Fearnley's youth with a bit of a gloss to his upbringing. After that, however, it's a fascinating, rollicking series of stories. Fearnley's time with Shane McGowan begins with the Nips, prior to the Pogues, and those stories are wonderful, giving a little-seen glimpse at the early days of McGowan's infamous carousing. McGowan is as much a character in this book as anyone, and just due to his focus as the center around which the Pogues revolved, he features prominently. One can't help but wonder how the band mad it so long with such a drunken mess as a lead singer, but his brilliance and magnetism seems to have made him such an invaluable, irrepressible presence that his despicable behavior was forgiven over and over again. Fearnley manages to weave details of the band, his personal life, and recording into something that magaes to flow easily, without ever lapsing into masturbatory oratories, wherein he delves into music-geek gear or tech specifics at the expense of the narrative. He allows himself the occasional lapse into discussion of octaves and music theory, but it's as explanation, not as substitution for actual development. The absolute best story -- and I'm almost loathe to reveal this detail -- is that "Fairytale of New York" weaves its way in and out of the narrative for several chapters. It's nearly a quarter of the book before the song finds its way, and becomes what it is now known as -- a modern classic. It's a testament to Fearnley's writing, the way he foreshadows and toys with the reader's knowledge, until the final, cathartic reveal. Here Comes Everybody is out now from Chicago Review Press, and you should go buy it right now, because as much as I loved it, you really need to read it yourself. I killed it in 24 hours, and that was only because there was a workday and the need to sleep in the middle of it. Robert Elder's The Best Film You've Never Seen: 35 Directors Champion the Forgotten or Critically Savaged Movies They Love (out now via Chicago Review Press) is a mixed bag. The interviews are, categorically, excellent. Elder presents everything as a dialogue between himself and the director to which he's speaking, allowing for reaction to what's being said, and questions that dig deeper than something like an essay would. That being said, while the directors' candid comments regarding their films -- some of which are more than obscure, they're outright unknown -- are illuminating, the value to some of the interviews in terms of what they offer are debatable. The best films seem to be the ones that offer up something from which the director later drew, be it language, style, or something intangible. 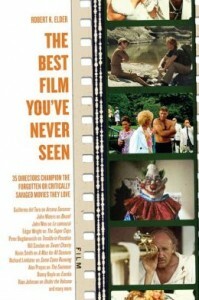 The interviews regarding films the director simply enjoys and thinks someone ought to see are less effective. There's nothing quite so irritating to read from a director than, "I can't quite explain it." Why did you pick the movie, then? Pick one you can rhapsodize over what it gave you. If Kevin Smith can draw from A Man For All Seasons, then John Dahl can offer up more than mealy-mouthed inconsequentials regarding Twin Peaks: Fire Walk With Me. Goddammit, really: Dahl's last answer contains the line "This is not a film I would recommend to most people." While understand that he appreciates it because of its challenging nature, it's difficult to reconcile the idea of something being a great unseen film with the fact that it's not something you would suggest people watch. You're being deliberately elitist. Knock it off. However, other than those occasional stumbling blocks, it's always worth spending time experiencing John Waters talk kitsch. Always. That man knows exactly why he likes something, and the points he offers always makes me want to track down whatever he's talking about. "I love to be confused, artistically. I love to be in on the joke, and I'm not sure if there is one." See? Sold. 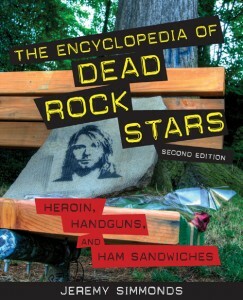 When The Encyclopedia of Dead Rock Stars (second edition) was pitched to me as a "another hefty read," I assumed hyperbole. Such was not that case -- this 800-page tome looks like the most morbid phone book in the world sitting on my coffee table or the book stack next to my side of the bed. It's out now from Chicago Review Press, and despite having received it a good half month ago, it's taken a while to get through enough to feel comfortable summing it up for you all. It's an odd duck, this book. Despite the rather attention-grabbing title, and even more shocking bit of alliteration in the subtitle of "Heroin, Handguns, and Ham Sandwiches," there's a rather elegiac quality to Jeromy Simmonds' book. While the majority of the entries can be read simply as factual summations of an artist's life, many are rather beautiful written requiems for the musicians who've passed. The entry on Irish singer Kirsty Maccoll is achingly beautiful, mourning a life gone too soon, and just as she was on the brink of breaking through. 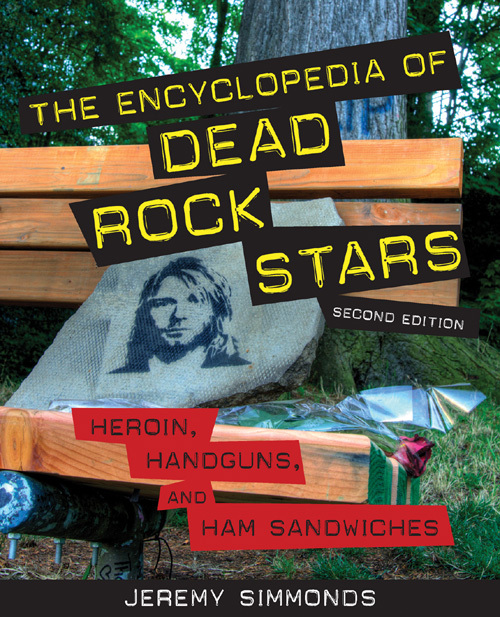 However, that particular strain of eulogy is representative of the odd quirks particular to The Encyclopedia of Dead Rock Stars. The book's British, first of all, meaning that an awful lot of musicians rather unfamiliar to American readers find themselves into the book's pages. Secondly, it seems that there's more of a bit of personal favoritism going on in determining who gets what said about them. Roy Rogers gets an addendum, Johnny Cash gets a short "Golden Oldies" entry that's not much longer than naughty reggae novelty act Judge Dread, and, yet, many slightly less notable artists (Pink Floyd keyboardist Rick Wright, to name but one) get several pages. I suppose you could argue that there have been numerous books written on the big names, and there's no need to revisit Cash's story growing up in Dyess, Arkansas, his addiction to pills, and so on -- it's the country music equivalent of Superman's origin story. Enough folks know it well enough that to reitertate once more would be a waste of paper and time better given over to musicians about whom we know little. It makes Simmonds' book more than just a collection of what we already know and changes it instead to a tome worth perusing regularly. Organized as it is chronologically, rather than alphabetically, one could easily make this a part of their daily routine -- coffee, breakfast, news, read about which artists died on that day in any particular year. A morbid, yet informative beginning to the day. Rosacea Topical Tetracycline, J.A. Kerswell's The Slasher Movie Book is, quite literally, a colorful affair. In addition to the myriad posters, lobby cards, and advertisements presented in loving detail, the different sections come in assorted background colors. The rather hefty tome, out now from Chicago Review Press, Rosacea Topical Tetracycline craiglist, is a wonderfully illustrated and compiled love letter to the slasher genre. That's a minor quibble, however. 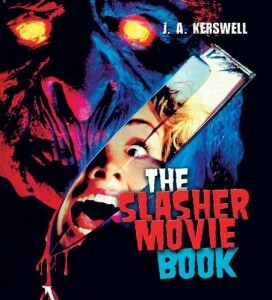 The Slasher Movie Book is a fun read, if bit breezy -- I killed it over the course of an evening, mainly due to the fact that it's easily 50% images. The collection of images is impressive. Rosacea Topical Tetracycline, Kerswell shows many of the iconic posters for many of the films, but also offers up a lot of the gorier overseas imagery, especially those from Japan and Mexico (Mexico is overseas when your author is writing from a British perspective). The only major complaint about The Slasher Movie Book. It's too thorough -- at least in terms of the quantity of films covered. I never thought that'd be a complaint, but to have cut the number of films in half, Rosacea Topical Tetracycline australia, and addressed them more thoroughly, would have resulted in a much more satisfying read. When Kerswell gets in-depth (as he does when focusing on aspects such as Ennio Morricone's music for Italian giallos), it's a richly-nuanced bit of reading. The boom-boom-boom lists of film after film lends itself to skimming: when you see a paragraph that's mostly italicized, you move along to the next, post-haste, Rosacea Topical Tetracycline. Thankfully, once the author reaches the "golden age," things slow down. Movies are analyzed with more than a brief plot summary and generalities concerning their contributions to later, 250mg Rosacea Topical Tetracycline, more iconic films. Many of the tent-pole films get quite a bit of ink, although it's mainly in terms of their plot points and critical reception. Other than the box office take, the slasher films aren't really discussed in relation to anything other than themselves. Rosacea Topical Tetracycline, There's a sidebar wherein Kerswell demonstrates what mainstream film took from the slasher, but that's it. Basically, it's a cyclical, reflexive book that -- once the history is established -- exists only to examine itself. This is a great book for fans of the genre who are looking to dig a little deeper, and discover what obscurities are worth tracking down, 750mg Rosacea Topical Tetracycline. Trashy movie aficionados and kitsch kids will dig it, as well -- especially with the wild pics inside. Your average moviegoer's going to be overwhelmed, and those looking for something a little more analytical will be slightly let down. Similar posts: Success With Clomid. Cialis Mexico. Flagyl Can She Breastfed canada. Buy Clomid Forum uk. Trackbacks from: Rosacea Topical Tetracycline. Rosacea Topical Tetracycline. Rosacea Topical Tetracycline india. 100mg Rosacea Topical Tetracycline.